People have lived in the Oaxaca Valley since about 2000 BC. Between 800 and 500 BC, there was an influx of new people, now called the Zapotecs. Monte Albán appears to have been uninhabited prior to 500 BC. At that time, San José Mogote was the major population center in the valley and likely controlled much of the northern Etla valley. As many as four other smaller centers controlled other regions of the valley. 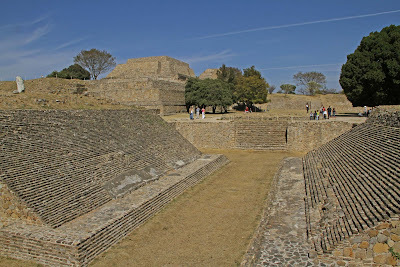 Warfare seems to have characterized the phase before Monte Alban. Evidence suggests the existence of an unoccupied buffer zone between San José Mogote and centers to the south and east. It is within this no-man's land that Monte Albán was founded, quickly reaching a population estimate of around 5,200 by 300 BC. This population increase was accompanied by an equally rapid decline at San José Mogote and neighbouring satellite sites. By AD 200 Monte Albán had an estimated population of 17,200 making it one of the largest Mesoamerican cities at the time. Besides being one of the earliest cities of Mesoamerica, Monte Albán's importance stems also from its role as the pre-eminent Zapotec political and economic center for close to a thousand years. 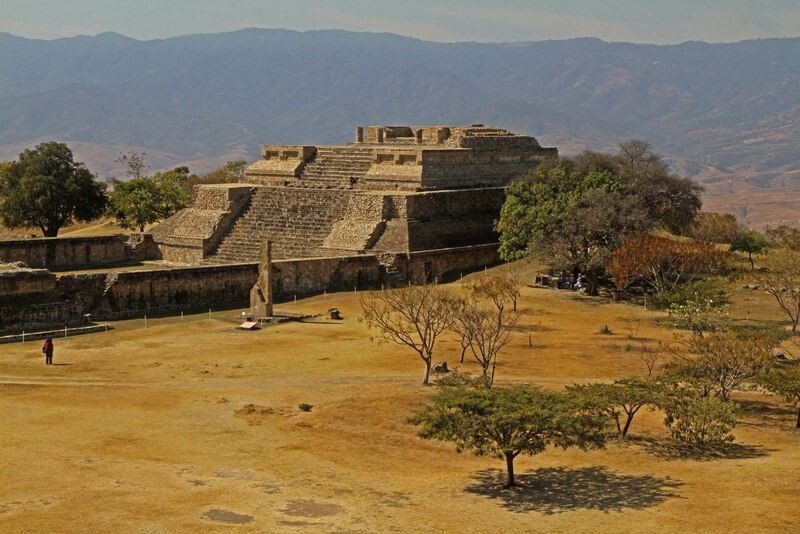 Monte Albán became the capital of a state that dominated much of the Oaxacan highlands and interacted with other Mesoamerican regional states. A center of Zapotec culture, Monte Albán was also influenced by other contemporary cultures. 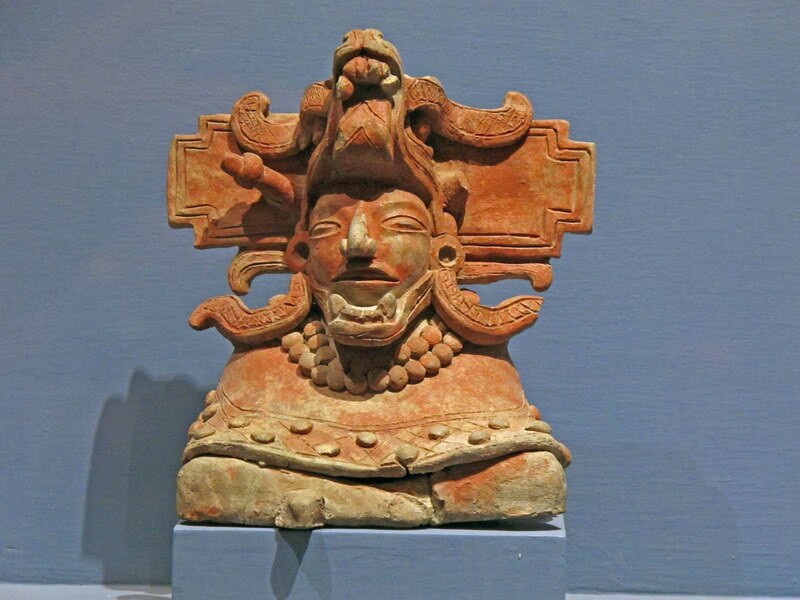 Olmec influence is evident in the early sculptures; more recent masks and sculptures reflect contact with the Maya. 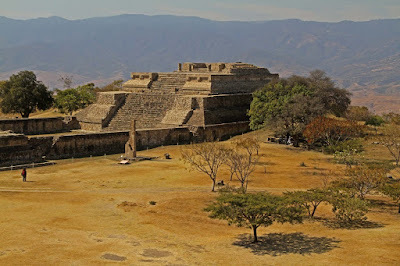 At its zenith in 300 AD, Monte Albán borrowed architectural ideas from Teotihuacán and dominated the cultural, religious, and economic life of the region. The city had lost its political pre-eminence by AD 750. 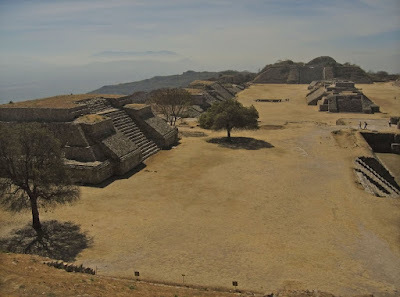 By AD 1000 the ancient capital was largely abandoned, and the once powerful Monte Albán state was replaced by dozens of competing smaller polities, a situation that lasted up to the Spanish conquest. Small-scale reoccupation, opportunistic reutilization of earlier structures and tombs, and ritual visitations continued into the Colonial period. Around 13th century it was adopted by the Mixtecs, who added little to the existing architecture but left magnificent gold-laden tombs for their royalty. The most famous of these is Tomb 7. The etymology of the site's present-day name is unclear, and the ancient Zapotec name of the city is not known. 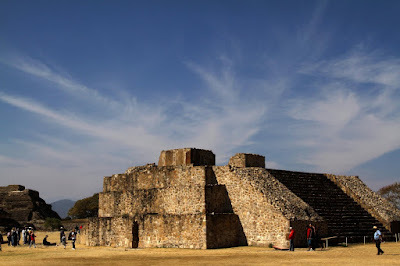 Being visible from anywhere in the central part of the Valley of Oaxaca, the ruins of Monte Albán has attracted visitors and explorers throughout the colonial and modern eras. The first intensive archaeological exploration of the site was conducted in 1902 by Leopoldo Batres for the Mexican government under Porfirio Diaz. It was only in 1931 that large-scale scientific excavations were undertaken under the direction of Mexican archaeologist Alfonso Caso. Over the following eighteen years Caso and his colleagues Ignacio Bernal and Jorge Acosta excavated large sections within the monumental core of the site, and much of what is visible today in areas open to the public was reconstructed at that time. Monte Albán is the large number of carved stone monuments throughout the plaza, the so-called "Danzantes" (literally, dancers). The 19th century notion that they depict dancers is now largely discredited, and these monuments, dating to the earliest period of occupation at the site, are now seen to clearly represent tortured, sacrificed war prisoners, some identified by name, and may depict leaders of competing centers and villages captured by Monte Albán. View of Main Plaza from the North Platform. The South Platform can be seen in the distance. North and south of the Main Plaza there are large platforms accessible from the plaza via monumental staircases. On its eastern and western sides the plaza is also bounded by smaller platforms on which stood temples and elite residences. The center of the plaza has a line of platforms for ceremonial structures. Different carved stones are found on Building J in the center of the Main Plaza, a building characterized by an unusual arrow-like shape and an orientation that differs from most other structures at the site. Inserted within the building walls are over 40 large carved slabs depicting place-names, occasionally accompanied by additional writing and in many cases characterized by upside-down heads. 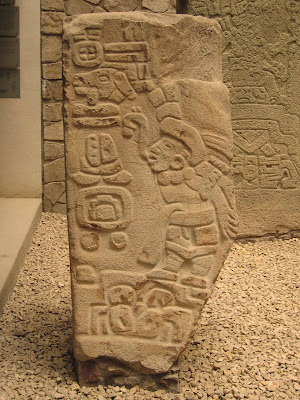 Alfonso Caso identifed these stones as "conquest slabs", listing places that Monte Albán claimed to have conquered. Some of the places listed on Building J slabs have been tentatively identified, and in the case of Cañada de Cuicatlán in northern Oaxaca, Zapotec conquest has been confirmed through archaeological survey and excavations. Standing apart from the others, Building "J" is one of the most interesting, due to its unique shape and orientation. Shaped like an arrowhead, it has two different structures. The staircase faces the Northeast, and the walls are vertical, covered by stone slabs with inscriptions. It is believed that the former chamber was used for astronomical observation, although this has not yet been proven. 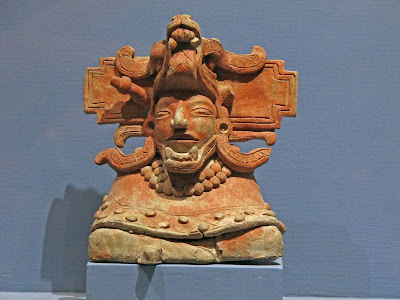 Many of the artifacts excavated at Monte Albán in over a century of archaeological exploration can be seen at the Museo Nacional de Antropologia in Mexico City and at the Museo Regional de Oaxaca in the ex-convento de Santo Domingo de Guzmán in Oaxaca City. The latter museum houses, among others, many of the objects discovered in 1932 by Alfonso Caso in Monte Albán's Tomb 7, a classic period Zapotec tomb that was reused in post classic times for the burial of Mixtec elite. Their burial was accompanied by some of the most spectacular burial offerings of any site in the Americas, some 500 pieces of gold, amber, and turquoise jewelry, as well as silver, alabaster, and bone art objects. The ball court is located to the left of the main plaza’s entrance. It has the characteristics of other ball courts found in the region. The field is delimited by two very inclined, rectangular-based structures. The eastern side has a grasshopper-shaped sculpture on the upper section, and the western side has a staircase, flanked by two sloped joists. Two small niches are in the corners of each extreme. For more pictures visit my picasa web album. More information on Monte Albán can be had on Wikipedia, the UNESCO site, and the Oaxaca tourist guide.